It is recommended to not rush your town hall. 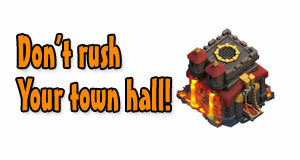 You can safely rush to town hall 7 or even 8 and then focus on upgrading your defenses and walls. TH 7 and 8 are considered the best th levels for farming and upgrading. Try to max out your whole village including troop upgrades at th level 7 or 8. That way you can farm on a maximum.